We are starting to get an idea of how tough it was for Broncos’ general manager John Elway to choose between Vic Fangio and Mike Munchak. So difficult, Elway wound up with both. After picking Fangio to be his head coach last week, Fangio and the Broncos agreed to terms Monday afternoon with Munchak to be their offensive line coach, a source told 9NEWS. Next up for Fangio is interviewing Rich Scangarello for his offensive coordinator position later this afternoon. Meanwhile, Fangio is hoping to interview Bears’ defensive backs coach Ed Donatell for the Broncos’ defensive coordinator position. The Broncos have not been allowed to interview Donatell until tomorrow. NFL policy stipulates a coach cannot be interviewed until the second Tuesday after their last game if they are not under contract for the following season. The Bears lost their first-round playoff game on Sunday, Jan. 6. The Bears are also trying to keep Donatell as their defensive backs coach, but after the team bypassed him for Chuck Pagano to replace Fangio as their defensive coordinator, the Broncos would seem to have a decent chance of bringing Donatell back for a third coaching stint. The Donatell situation should be decided Tuesday when he is freed up to interview with Fangio. Donatell was Fangio's defensive backs coach the previous eight seasons. A potential factor is that while the Broncos can offer Donatell the title of defensive coordinator, Fangio will actually serve the role as he will call the defensive plays on game day. If Scangarello, 46, passes his interview test with Fangio this afternoon, he is expected to become the Broncos’ next offensive coordinator. Scangarello served the past two seasons as the quarterbacks’ coach for the 49ers, where he worked under head coach Kyle Shanahan. Although Scangarello’s scheme figures to be heavy with zone blocking in the run game, he is apparently comfortable with Munchak as his offensive line coach. 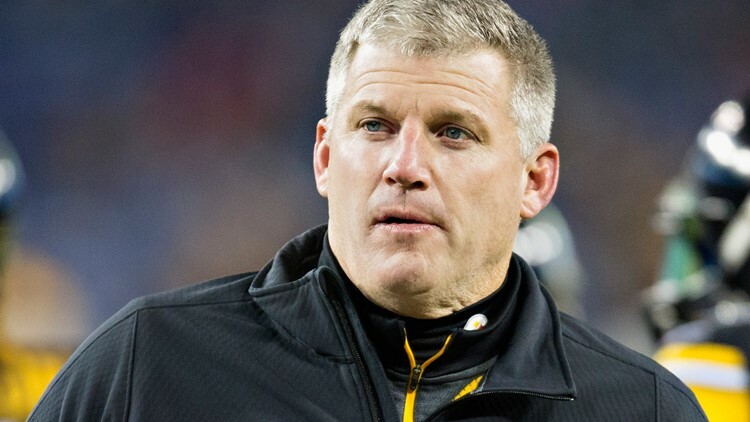 As he should be: Munchak is widely considered the game’s best offensive line coach. Munchak’s Steelers do both zone and gap-type blocking while mixing in their share of pulling guards and counter plays. Munchak was a nine-time Pro Bowl left guard for the Houston Oilers from 1982-93, a career that was stamped with his induction into the Pro Football Hall of Fame. He later became head coach of the Tennessee Titans, posting a 22-26 record from 2011-13. Among the five candidates Elway and his committee interviewed for the Broncos’ head coach position, Munchak finished second to Fangio. Munchak and Fangio grew up in Northeastern Pennsylvania bordering towns of Scranton and Dunmore, respectively. They are now transporting their roots to the Rocky Mountains. Why wouldn’t they?